Natural remedies are nature’s gift to us. Evolving research-demonstrating alternatives to side-effect-ridden prescriptions and solutions that will amplify the effectiveness of a healthy lifestyle-suggests that plants may have more power than we could ever have imagined. 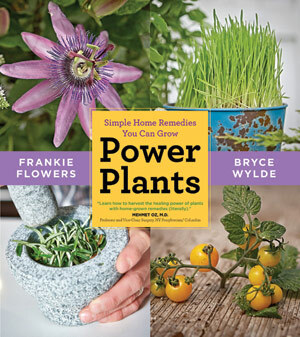 Now two of Canada’s top authorities in their fields, gardening expert Frankie Flowers and alternative medicine expert Bryce Wylde, show readers how they can harness the powerful healing of plants simply and inexpensively by stepping into their garden. Power Plants introduces you to a carefully curated list of forty-nine plants that can be grown in almost any Canadian garden. Frankie’s easy instructions lead readers from planting to harvest, where Bryce picks up with clear guidelines on how to put the plants to work fighting everything from constipation to heartburn, high blood sugar to bad breakouts. It even includes simple substitutions for those whose ailments include a thumb that is more black than green. Let Power Plants supercharge your health with a simple trip into your garden.